You have worked hard to get your sourdough starter going and keep the yeast alive and happy. You have also found that you don't have the time to bake sourdough bread once or twice a week. There's no need to continue using up flour unnecessarily or give up completely on your starter. Instead of pouring your excess starter down the drain, put it into hibernation and freeze or refrigerate it. The yeast can survive the cold temperatures and be revived when you want to bake bread again. Why Store Rather Than Feed Your Starter? Sourdough starters take some work, and that is why many bakers choose to avoid this style of bread. Depending on the season and the temperature in your kitchen, you may need to feed your starter as much as once a day. In the summer months, you may even find you have more yeast than you need. The reality is that many of us simply don't have the time to add one more chore to our daily to-do list. Sourdough starters can be forgotten, and the yeast will die if not fed on a schedule. The solution to this common problem is to keep the starter at a cooler temperature, which retards the activity of the yeast. It's the perfect answer for the occasional bread baker who wants to keep that perfect starter alive but also wants to avoid the maintenance. Your options are to either refrigerate or freeze your starter. Either way, it will preserve the organisms and, as soon as they thaw and you return to a feeding schedule, they will be as lively as they ever were. Deciding whether to freeze or refrigerate your sourdough starter is a personal matter. The factor you need to consider is how often you want to bake sourdough bread. If you would like to bake sourdough once every two weeks or even once a month, refrigeration is your best option. On the other hand, if you want to store a starter for the long-term, freezing is the way to go. This is ideal if you know you will not be baking for a month or two, or when you're traveling, or if you want to preserve a rare starter and use it on special occasions. In both cases, there is no need to feed the starter. It will go dormant, much like a bear in winter hibernation, and will not need extra the flour and water to keep it alive. Whether you choose to freeze or refrigerate your sourdough starter, you will need to plan for your baking. It's best to allow 2-3 days for the starter to warm up and become active again. During this time, be sure to feed the starter to give it a good jump start and ensure your first loaf is a success. Place one cup of your active sourdough starter into a jar with a tight-sealing lid. If it's a very liquid starter, you might have better luck making it a bit stiffer. To do so, add 2 parts flour and 1 part water (you can add equal parts flour and water after warming to bring it back to a more liquid state). Seal the jar and place it in the coldest area of the refrigerator. Feed your starter once a month. When it's time to bake, remove the starter and allow it to warm up. The freezer is your long-term starter storage solution, and it requires no feeding. The same advice applies for pre-planning your first sourdough bread bake. However, because of the much colder temperature, you might want to allow a full week for it to warm and become completely active again. Every starter is a little different, so use your best judgment based on your personal experience. Freeze one cup of starter in a freezer-safe jar or plastic bag. When it's needed, remove the starter from the freezer and allow it to thaw in a bowl. Your starter will need food as it thaws. The yeast is a hungry organism and requires nourishment to come out of the hibernation you forced on it. For this reason, it is important that you get back on a feeding schedule before using it for that first loaf of bread. The amount of time needed to thaw a preserved starter is going to depend on your particular starter and the climate of your kitchen. It may be ready for bread within 2-3 days, or it may take a little more than a week. The key is that you get it back to an active growing state similar to what it was before freezing. On the first day, remove the starter from the refrigerator and discard at least half of it. Feed it as normal. If needed, feed it again later in the day (if you take it out in the morning, feed it again at night). Continue feeding the starter once or twice a day as you normally would until it becomes as active as it was before freezing. 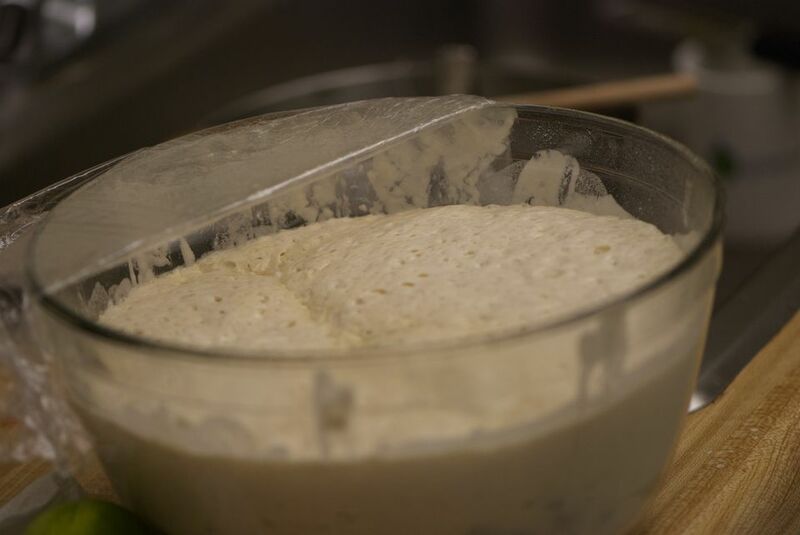 When you notice that the growth activity is stable, the starter is ready for bread baking.